After the hard work of finding and buying a home, the next years (or decades) are spent enjoying and preserving your investment. Regular maintenance such as routine servicing, upkeep, and repairs are critical to keeping a home in good condition. From weekly chores to larger repair bills, all these purchases can add up in a year. But how much exactly can one expect to spend on maintaining a home? According to experts, it’s 1% of a home’s value. So we decided to poll Oregonians on how much they believed one should spend on annual maintenance to see if they could guess correctly. Because Oregon repairs tend to cost less than the national average, that may account for the propensity to guess a lower annual repair budget. Of all the residents who responded, 57% guessed repair costs under $2,000 (with the majority guessing $1,000 or less). Income played the greatest role in this result, with the majority of the low responses coming from individuals earning between $25,000 – $75,000. Since the home value of $267,000 asked in the survey is based on the current median listing price in Oregon, it’s surprising that middle class participants are most likely to miscalculate the number. On the contrary, low income and high income households anticipated annual costs to be higher, stating $2,859 and $2,835 respectively. While annual repairs can run a homeowner into the thousands annually, a home warranty service contract could lower the costs. The average price of a warranty is $450 per year – significantly lower than the average expected maintenance costs in Oregon. Though home warranty service contracts do not include regular maintenance like cleanings and inspections – and excludes larger items such as roofs and septic systems – they do include important repairs on well maintained appliances, which could save homeowners thousands in replacement and installation costs. 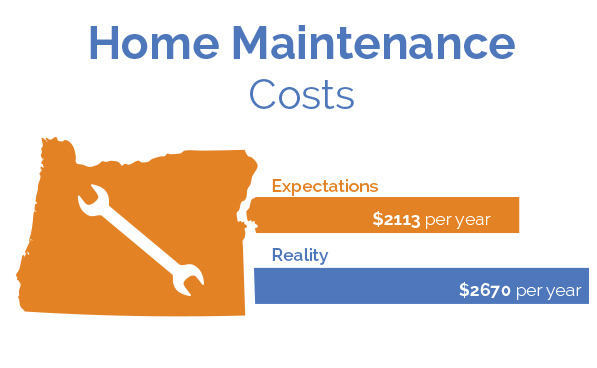 The Choice Home Warranty survey asked respondents aged 25-34 in Oregon “On an average-aged $267,000 valued home that you own, how much would you expect to pay in home maintenance costs per year?” using the Google Consumer Surveys tool. The survey ran in October 2014 and gathered 999 responses. Results are weighted by inferred gender, age, and geography to reflect the population.